ASP Joseph Ayiki has been relieved of his duties. File photo. GULU–Acting Gulu District Police Commander ASP Joseph Ayiki has been sacked, a day after he was shot and injured by a private security guard. Mr Ayiki was shot in the leg by a security guard at Through Arts Keep Smiling (TAKS), a Gulu based daytime recreation centre on Tuesday night. He is still undergoing treatment at St. Mary’s Hospital Lacor. This website has since learnt that ASP Ayiki was fired during a meeting called by the Police Professional Standard Unit (PSU) on Thursday in Gulu town to review circumstances under which the police officer was shot. The meeting was chaired by Detective Superintendent of Police Osteen Wilber Wanyama, who is acting as Regional Police Commander for Aswa River Region. The meeting decided that ASP John Bosco Nyangkol; the OC in charge of operations at Gulu Central Police Station assumes the office of the DPC with immediate effect while AIP Peter Susu was assigned the office of OC Operations. 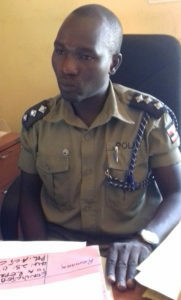 Inspector of Police Moses Ogwang replaces ASP Nyangkol as acting OC Station. ASP Patrick Jimmy Okema, the Aswa River Police Spokesperson, confirmed the changes, saying it aims at filling gap created by ASP Ayiki’s sickness. Police Spokesperson Emilian Kayima added that the move is to prevent gaps in the command chain and management of Police in Gulu district. Unverified information posted by a volunteer (name withheld) of TAKS centre on social media says the acting DPC was shot when he jumped over the fence and was checking doors of vehicles parked at the centre. It is also alleged that he was attempting to pick executive chairs and tables left under the tents of belonging to Post Bank prompting the centre guard to shoot. Circumstances surrounding the shooting of ASP Joseph Ayiki remain a subject of investigation and public discussion in Gulu district. 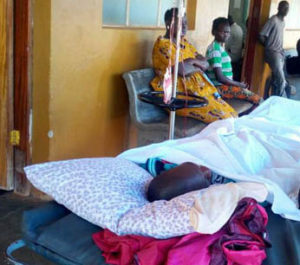 He is still nursing wounds at Gulu Regional Referral while David Olanya, the EXPOSS security guard who discharged the lone bullet at the commanding officer remains under police custody at Gulu Central Police station. ASP Joseph Ayiki on his hospital bed. He was allegedly shot when he attempted to pick executive chairs and tables from a recreation centre in Gulu town. Courtesy photo.